In my last post, I touched on the end of George Gibson's career, in a way. The culmination of years of playing, managing, teaching and treating wounded fingers was his induction into the Canadian Baseball Hall of Fame. This week, let's go back to the beginning. Or at least, closer to the beginning. If you collected baseball cards in the 80's and 90's, then you almost certainly remember the rookie card craze: The hoarding of thousands of Donruss Rated Rookies or Topps Traded cards of a certain player and just waiting to cash in and retire to a life of luxury. Of course we know now it didn't play out that way. At least not for the majority; I'm sure somebody made some pretty good money off of those cards, though I'm guessing they cashed out like 30 years ago. My guess is that most people that invested in 1000 Gregg Jefferies or 500 Kevin Maas cards are still waiting for the right time to cash out. Now, if you're like me, then even though you aren't looking to hoard and retire on rookie cards, you do still have some appreciation for them. When it comes to pre-war baseball cards, labeling a rookie card becomes a bit of an challenge. For starters, what defines a card? Is it the dimensions? The material? Does it have to be available nationally? How is it packaged? Can it be round? What if it's mounted on something? Can it be a team photo? And once those questions have answers, we have to ask about the league. Can a rookie card be from the player's minor league team or does it have to be their major league? And what defines a major league? What if the player's major league debut was in that awkward 1901-03 era when the American League was forming? Or what if it was during the Federal League era between 1913-15? To re-iterate the point: defining the rookie card for prewar players is tough. What card that I currently consider to be George Gibson's major league rookie card is the 1902-11 W600 Sporting Life Cabinet. It seems to be generally accepted that this card was issued in 1905. These cards could be ordered directly from Sporting Life Magazine; I assume researchers have noted that Gibson shows up as early as 1905 in the list of players that could be ordered. That's pretty good reaction time by Sporting Life, considering Gibson didn't debut with the Pirates until July 2, 1905. Without knowing the first date Gibson's W600 became available, there might be one other contending issue for Gibson's rookie card as well. A 1901-17 Police Gazette Supplement was issued on August 12, 1905 of the Pittsburgh Pirates team. So it's possible that Gibson's rookie card was issued less than 6 weeks after he made his debut -- BUT -- that's only if Gibson is in the picture. I have yet to see a good, clear, scan of this issue to even confirm if Gibson is in it. And again, all of this is really dependent on how you define a rookie card. There are a few, extremely rare, issues that feature George Gibson while he was still playing with the Montreal Royals in the Eastern League. If you're definition of rookie card includes minor league cards, then all of what I've just written is moot. 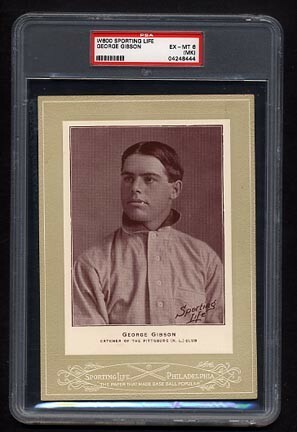 If you know of another issue featuring George Gibson that you would classify as his rookie card, share your thoughts, I'd love to hear them! Great point about rookie cards. I collect football player Frank Gatski and since he only has one "mainstream" card, it's his rookie. There were regional cards released prior. At this point in collecting, with the world opened up, I would personally just consider the first card released a rookie card, but that's just me. Admittedly, I had to look him up, but Frank Gatski is a perfect football example. Looks like '55 Bowman is his first "card" yet he had already been in the league for nearly 10 seasons when that came out. I see that there's a 1951 Team Issue of him, but it's probably more like a photo...does that count as a card to you? Last September I went to a card shop for the first time in years. I asked the guy how often does someone try to sell you junk wax. He told me multiple times a week. Sure enough while I was in there someone came in with a bunch of early 90's stuff including Starting Lineups. Poor people look so dejected when they hear it is not worth anything. Good points about rookies. I don't really have a completist mentality with my collection so I just nab what I like whether it has rookie status or not. The line gets kind of blurry these days because their are so many cards. I kind of agree with Kin that the first card produced back then seems like it should have the rookie card status.